The SBIT 2nd Year Animators are about to start to build their own personal websites. Could you, dear reader, share some inspiring examples of Flash animated websites that could kickstart their creativity? Note that we want to see sites that incorporate some swish animation INTO the design of the site - not, say, static websites wherein the user clicks a button that opens a movie in a new window. 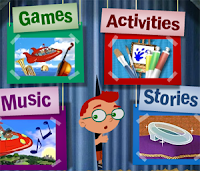 I'll start by offering the website of Disney's Little Einsteins (one of my current favourite shows - love those simple vectors). Liquid Animation (www.liquidanimation.com)have a lovely site. There's no character animation in the site proper, but there's plenty of "motion graphics" animation. It's very nicely done, and I urge the students about to start building their own sites to consider doing similarly funky things with their text and page transitions. Hey Terry's got an icon! Congratulations Terry! You can filter the site by catagory or search for topics using the controls in the top left hand corner. The design is fun, colourful, and has a simple layout. For navigation you can either work your way around in the main window or use the quick links underneath. The site contains a bunch of flash movies, within different categories. And lastly, the animation is all over the site, for the buttons, as transitions, as menus, and even on the disclaimer and about pages. The design of the site is really nice- mainly what keeps me goin back for more. The navigation is clear and really easy, down the left and some secondry links on the main page. The site is packed full of stuff, animations, informations, past jobs, what they're working on at the moment, and (awesomely) a shop!!! the animation is really good, in the way that its quick, but so appealing. It breaks up the site, so you know when you've gone to a different page, as bigfish have gone for quite similar page layouts for each link. Overall a really nice site. The design is very sleek and professional. Each page of the webiste links up to each other when the different sections are clicked. Re-using the same shapes for each section of the site. Navigation is very simplistic. Buttons are well titled and easy to read. The site is of the company is a animation/film studio at West End. They work on both small and large projects. The site displays clips from their work and also awards they have won. The animation links up to each page. Any page clicked on links up with the next. The site uses the same logo for each animation. Which then gives consistency with the animation. Design: Site layout: Awesome large graphic as a "Splash" page. This is a bit confusing, as it is not 'clickable'. Closer ivestigation displays a standard navigation bar at the bottom of the page. Once in the site (home page), the layout is clear. Each icon blinks and animates on rollover in an amusing way. Navigation: The site navigation is well labelled and intuitive. There is a standard navigation design at the top of each page. Content: There's links to: animation episodes, interactive games, the merchandise store... there's even a light switch, which gives the visitor a laugh. Animation: The animation in the navigation is meaningful. For example, Games, Poopy plays a games controller. Ok so i found 2 sites that i like. The design is simple, lots of colour! Its very easy to navigate around and simple to use. Content, hmm well its an animated educational site, they use cartoons and animation to teach everything from art to science. The animation is simple. Theres animation on most of the title buttons as well as animated clips running alongside them. I just really liked the introduction, with the stars flying past, but especially the words, how they moved in and out of the screen. Design is formal, easy to navigate around, the site is for an interactive entertainment company so of course its good, lots of cool effects, with lots of flashy transitions. The animation was a 3D mixed with flash and its animation is the progression of the car every step shows how it was built starting with the parts of the car to the end, the complete product. Manages to look both profesional as well as cute and friendly, easy to navigate with some nice subtle character animation. This one has a very interesting look, not much animation though. Download the "EasyMan" Maya rig.